When you find out you’re pregnant in Japan, one of the first things you’ll want to do is “shop around” for hospitals. Despite living in Tokyo, where you might assume there is loads of information on this process available in English, I actually had a difficult time finding out much about hospitals at all. (I will say, however, that had I learned about the Tokyo Pregnancy Group earlier on, I could’ve gotten loads of advice from other pregnant ladies in the city.) After trying my best to inform myself on a good hospital, I ended up choosing St. Luke’s International Hospital, which is known for being an excellent hospital with great English accessibility. It’s also known for being expensive, but at my first appointment a nurse told me the due amount at birth would be around 90000 yen (somewhere near $900 USD) and I thought that sounded super reasonable. As I mentioned before, St. Luke’s doesn’t offer epidurals unless there is a case of severe pain or other extraneous circumstances, but the quality of the hospital seemed to outweigh my lack of a choice in the matter. No English documents about the price were ever provided to me, so I went along merrily at St. Luke’s until I was about 37 weeks pregnant. Then came the day in which we got a big shock: when we went to book our room at St. Luke’s, we were told the price before government assistance after birth would be 1200000 yen (over $10,000 USD). It seemed the nurse who I talked to when I first chose St. Luke’s made a serious error in her English. We were speechless, and after leaving the appointment decided immediately that we needed to transfer to a different hospital. Over the next day and a half we were on an incredibly stressful and difficult mission to change hospitals. Another choice we were given was to go to St. Luke’s Birth Clinic, which is connected to the hospital, but significantly cheaper. However, we were warned that 1 out of 3 women are transferred to the International Hospital from the clinic and then have to pay the hospital fee anyway. Reasons for transfer could be as small as needing an episiotomy (which I did, in the end). The possibility of being transferred to the main hospital seemed risky to us, so we decided to keep looking. Ultimately, after getting loads of helpful advice from some friends and from the ladies in the Tokyo Pregnancy Group, we decided to transfer to Aiiku Hospital. We were very lucky the hospital accepted us as it is generally very difficult to transfer (hospitals in Japan require “booking” early in pregnancy and are super reluctant to accept patients later on in pregnancy). I cannot express how rough the hospital search and transition was, but on the bright side, our overall experience at Aiiku Hospital was positive. In my next post, I’ll be writing more about my experience with Aiiku in general, but for now I wanted to provide an infographic that compares some basic information about St. Luke’s International Hospital and Aiiku Hospital. If you’re a reader who has gone to either hospital, please keep in mind that I am writing about my experiences, and that I understand others may have had a totally different experience. One of my biggest goals is just to make my experience available to women who are in the situation I was in months ago, or to share with others what it was like being pregnant in Japan. I hope this post is helpful! 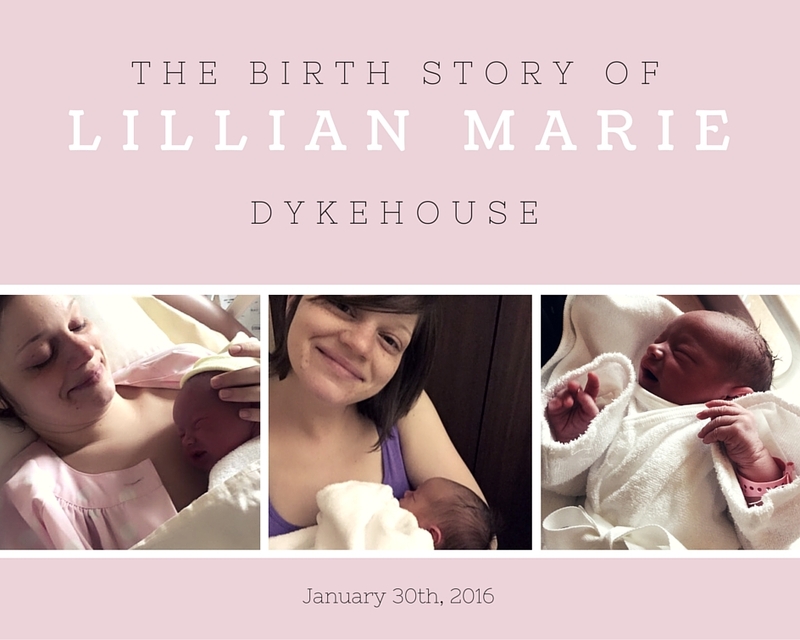 We are so happy to announce the birth of our sweet Lillian Marie Dykehouse! 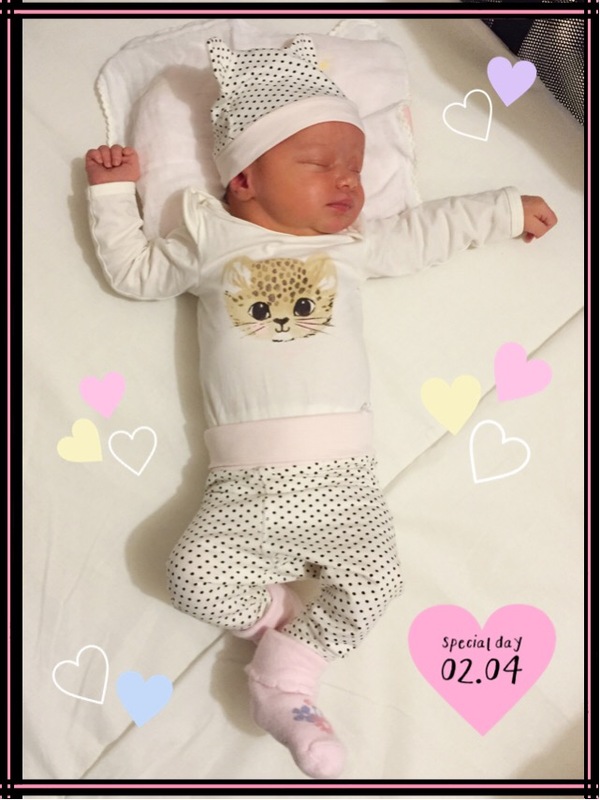 By my weekly checkup on Thursday, January 28th, it was 3 days past Lillian’s expected due date, and doctors guessed we would have to begin the process of inducing labor on Monday. This would start with me coming to the hospital that day to receive something called lamaria, a seaweed native to Japan used to dilate the cervix. I really wasn’t comfortable with the idea of using lamaria, but the doctors insisted that unless I had dilated naturally at that point, that was my only option. I was a little frustrated about the lack of negotiation on this point, so I just hoped Lily would come on her own or that I would be dilated enough not to have to get the lamaria. Either way, on Tuesday I would be given meds to further progress induced labor if necessary to officially get things started. On Friday the 29th, I was still feeling a little anxious about the possibility of induced labor, but I was happy to know that either way we’d have our sweet baby soon. My pregnancy experience overall was really good–I was thankful that Lillian was always healthy and that I was, too. However, by the last couple of weeks she was resting on nerves that gave me continual leg cramps in my thighs every time I walked, I was very achy and sore, and I was quite tired overall. I was so ready to have Lillian! Chad and I decided to go out for dinner to get some okonomiyaki, and had a really nice time despite the gloomy weather. It was very rainy and cold, and I told Chad I hoped the rain wouldn’t turn to ice over night in case I did go into labor and we needed to get to the hospital. After dinner I also said–just in case–that we should get out some money for a taxi. I don’t know if something in me knew what was coming, but around 9 or 10 o’clock I started to feel contractions. Now, to be honest, I thought maybe the contractions were really bad gas pains at first. After all, the previous day we had eaten something called Calico Beans and I thought it had just been killing my stomach. (Side note: because of this association with Calico Beans and contractions, I really don’t want that for dinner any time soon!) When the contractions started coming about every ten minutes from about 2 in the morning, I knew for sure Calico Beans weren’t the cause of the pain and we called the hospital. As I will explain in a future post, we had to switch hospitals about three weeks earlier, and one of the downsides was that our new hospital, Aikku Hospital, didn’t seem to have as many fluent English speakers as our previous hospital. So when I called at about 3 or 4 am to tell the hospital about my contractions, I was shocked to be told there was no one who spoke English there at the moment, but that the nurse I was speaking to would try her best if I spoke slowly. Despite an experience earlier in the week with terrible communication issues over the phone, I was still incredulous that there was no one I could talk to. After several minutes of painful attempts to communicate (both painful in the mental sense from the language barrier struggle and the physical sense from having contractions at the same time), the nurse told me to call back once the contractions were occurring 5-6 minutes apart. Around 6 am, the contractions suddenly went from coming 10 minutes apart to between 2 and 3. We didn’t waste any time and called a cab before dealing with another phone call to explain to the hospital we were coming. At this point, I was able to practice a few techniques I had learned in a prenatal yoga for birth preparation video I had been doing for a month or so. I would stand leaning against a wall or the top of something shoulder-height, put one foot back a ways and the other forward, and sway while breathing: in 5 seconds, out 5 seconds. Once we were in the taxi, I continued breathing in the same manner. The taxi ride to the hospital was about 30 minutes. We used a taxi service called Nihon Kotsu, a service you sign up for in advance online. The service is wonderful because they knew my due date, our address, and the address of the hospital. They also have English speakers available on the phone 24 hours a day. When we got to the hospital, I was ready to have our baby already, though tougher contractions were on their way and I still had hours to go. First, I changed into a hospital gown, and after only a half an hour or so went to take a bath. I was brought breakfast but could only drink the milk box (poor Chad, who was starving, ate a couple bites at my insistence and was probably so sad to see them take the tray away mostly uneaten soon after). Whenever I walked anywhere, I would still stop and sway with each contraction. I slid into the tub and let out a deep sigh of relief, only to have the strength of the contractions suddenly go up a notch. At this point I began to hum through pursed lips on my exhales, really focusing on the sound of my voice. It wasn’t long before the contractions got so strong that I started feeling the urge to push, and I was out of the tub, back in the LDR (labor, delivery & recovery room). A nurse checked my cervix and said, “Wow! You’re already dilated to 6 cm!” To this I replied, “That’s it! ?” I remember thinking to myself, I can’t do this. I can’t do this anymore. No, I can. I have to. And I will. Don’t say can’t. Things continued to progress, and I was able to see the image of her head emerging reflected in the nurse’s protective glasses. Every time I pushed I tried to look and see if she was any closer to coming, but it never looked that way. Soon a team of 3 nurses came with a doctor, and they helped to “open things up” with each push because her head was a bit big for my body. I remember feeling like the whole experience was so painful and bizarre and new, and like I was almost outside of myself watching the whole thing. I had a hard time relaxing in between contractions, so much so that the nurses kept trying to remind me to relax and breathe, and that I told them, “I can’t!” They said, “You can!” but then I had another contraction and couldn’t listen to them anyway. Technically after delivery you can stay in the LDR for a couple of hours, but I think we ended up staying a little longer. I didn’t question our extra time because I was very glad for it. I had a little lunch and Chad snacked on a granola bar and canned coffee (the hospital restaurant was strangely closed), and after a while we made the transition to what would be my room for the next five days. Then, our journey as parents begun! I’ve always had a respect for other mothers, but after experiencing childbirth myself I am even more blown away by the awesomeness of the human body. I have had some medical hurdles to overcome before, but nothing compares to the challenge of childbirth (and of course, nothing has come with such a sweet reward!). 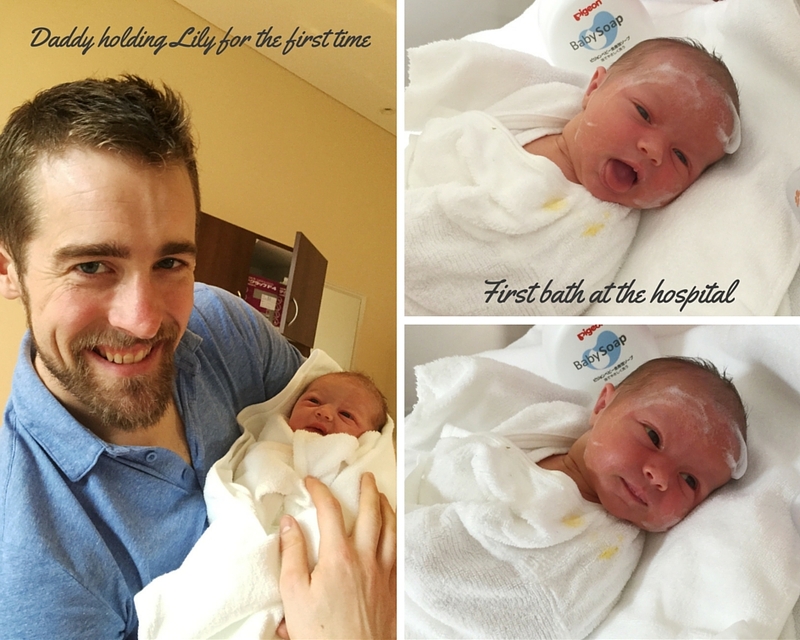 I hope you’ve enjoyed the story of Lily’s birth, and that if you’re pregnant (especially in Japan!) it has helped you or encouraged you in some way. More to come soon about my hospital experiences before and after birth! P.S. Lillian was born on National Croissant Day! Who would’ve thought after my last post that I’d be given yet another reason to love croissants?